Trick or Treat, fellow pokemon trainers! And welcome to this scary edition of Pokemon of the Week! As you know by now, our goal of Pokemon of the Week is to inform you trick or treating trainers on pokemon you may encounter on your spooky adventures. 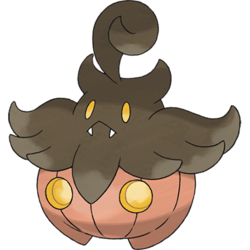 This week’s spooky pokemon is Pumpakboo, the Pumpkin pokemon! Our national Spookdex says it’s number is #710. It evolves through trade into Gourgeist. Our spookdex entries state that “the pumpkin body is inhabited by a spirit trapped in this world. As the sun sets, it becomes restless and active”. As a ghost and grass type pokemon, it is a pretty okay pokemon. Not the best to have against the Elite Four spooks, but still it’s a pretty cute and spookfully powerful pokemon. That’s about enough Halloween puns for one week. This has been Pokemon of the Week!